Use as part of a varied and balanced diet and healthy lifestyle. Excessive consumption may cause laxative effects. Store in a cool dry place away from direct sunlight. Protein Blend [Milk Protein, Collagen Hydrolysate, Soya Protein Isolate], Caramel Layer [Sweetener (Maltitol), Condensed Milk, Cocoa Butter, Water, Humectant (Sorbitol), Emulsifier (Mono and Diglycerides of Fatty Acids), Flavourings, Salt, Colour (Plain Caramel)], Cocoa Mass, Sweetener (Maltitol), Cocoa Soya Crispies [Soya Protein Isolate, Tapioca Starch, Cocoa Powder], Humectant (Glycerol), Water, Cocoa Butter, Coconut Oil, Cocoa Powder, Flavourings, Emulsifier (Soya Lecithin), Natural Vanilla Flavour. 31% dark chocolate coating. Protein Blend [Milk Protein, Collagen Hydrolysate, Soya Protein Isolate], Caramel Layer [Sweetener (Maltitol), Condensed Milk, Cocoa Butter, Water, Humectant (Sorbitol), Emulsifier (Mono and Diglycerides of Fatty Acids), Flavourings (Milk), Salt, Colour (Plain Caramel)], Sweetener (Maltitol), Soya Crispies [Soya Protein Isolate, Rice Flour, Barley Malt Extract (Gluten), Salt], Cocoa Butter, Humectant (Glycerol), Whole Milk Powder, Water, Cocoa Mass, Coconut Oil, Flavourings (Milk), Emulsifier (Soya Lecithin), Natural Vanilla Flavour. 31% milk chocolate coating. PhD Smart Bar is a great tasting, triple layered high protein, low sugar bar that is free from palm oil. 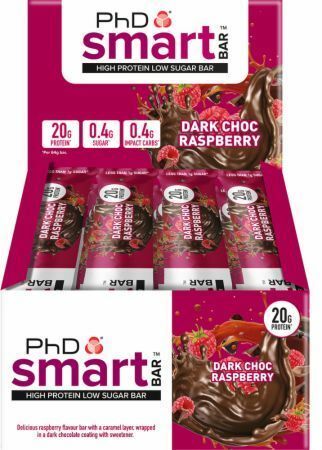 With 20g of quality protein and less than 2g of sugar per bar, PhD Smart Bar is the intelligent way to get your daily protein fix without adding unwanted carbs. Smart Bar is available in a variety of flavours including Caramel Crunch, Cookies & Cream, Dark Chocolate & Raspberry, Choc Peanut Butter and Chocolate Brownie. Each bar is filled with a delicious caramel layer and cocoa crispies and encased in a rich chocolate coating, making Smart Bar Cthe perfect high protein snack.